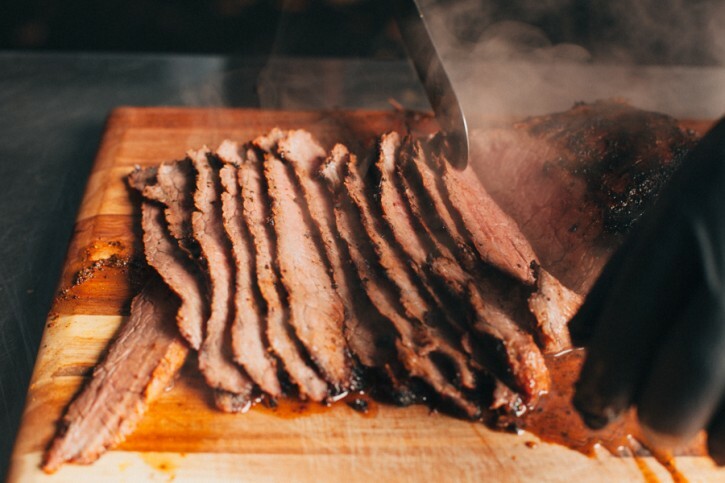 Flank steak being a tougher cut of beef is not a problem. We have a brine/marinade to not only flavor but also tenderize the meat. That, combined with slicing the meat nice and thin, against the grain, makes for a nice and tender piece of steak. Seriously, everything that Sweetwater Spice produces is liquid gold. 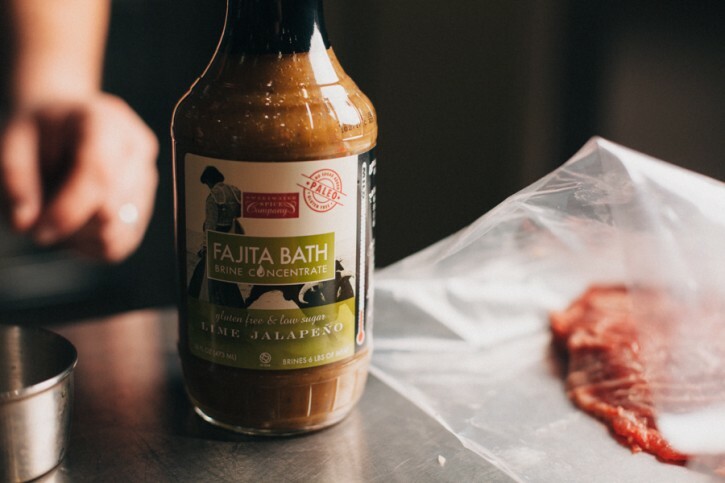 This “fajita bath” uses both acid and salt to marinate and brine the meat. 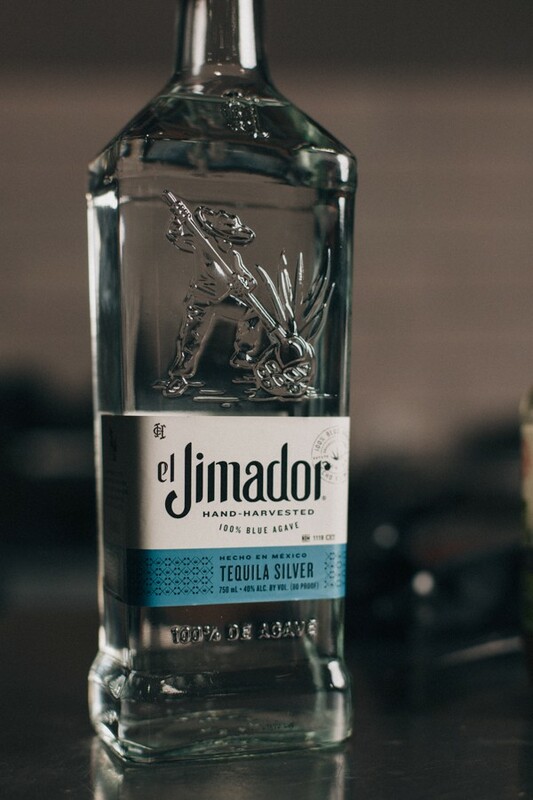 Love the flavor that this silver tequila infuses into the meat! 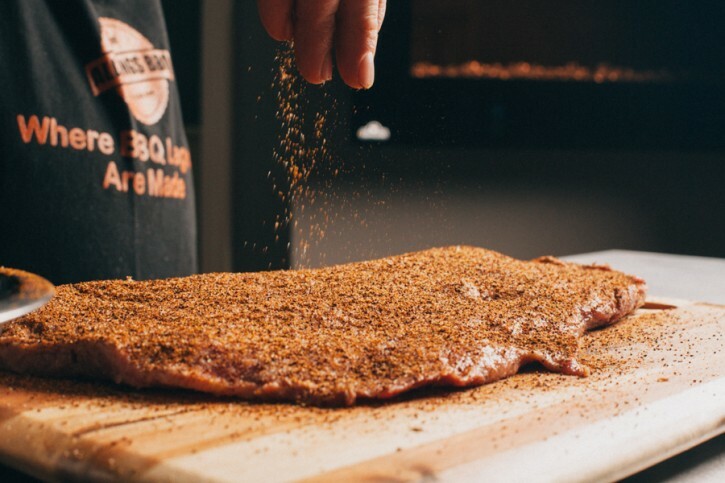 I was super excited to test drive our latest addition to the Oakridge BBQ line of rubs, the Carne Crosta Steakhouse Rub. It did not disappoint. Great coffee flavor accompanied by sweet and savory Latin spices, herbs and chiles. Plenty of good color on the outside, thanks to our GrillGrates and the new Yoder Smokers heat diffuser with access door, which also allows you to move the steak off to the right side if you need to slow that browning process down. 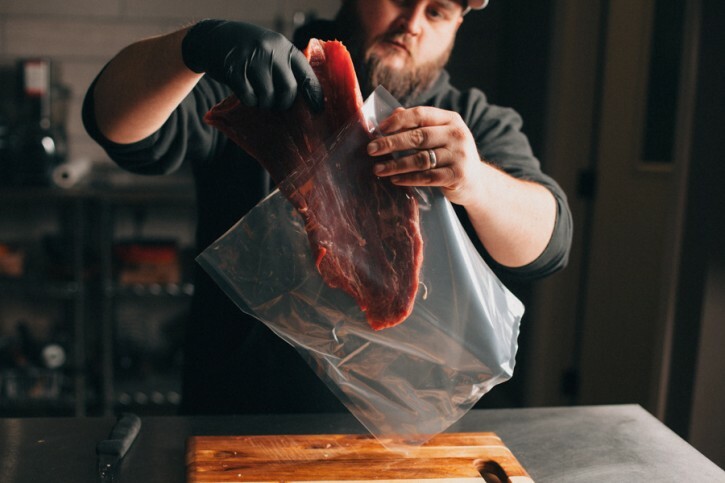 Trim any excess fat and connective tissue from the outside of the flank steak. Place it in a zip top or vacuum bag with one (16 fl oz) bottle of Sweetwater Spice Lime Jalapeño Fajita Bath, two cups of water and the 3/4 cup of tequila. Marinate in the refrigerator for an hour. Preheat your Yoder Smokers YS640 to 425ºF, set up for direct grilling with GrillGrates. Remove the flank steak from the marinade, and pat dry with paper towels. Season all surfaces with Oakridge BBQ Carne Crosta Steakhouse Rub. Rest 5-10 minutes. Grill on both sides to achieve nice grill marks. 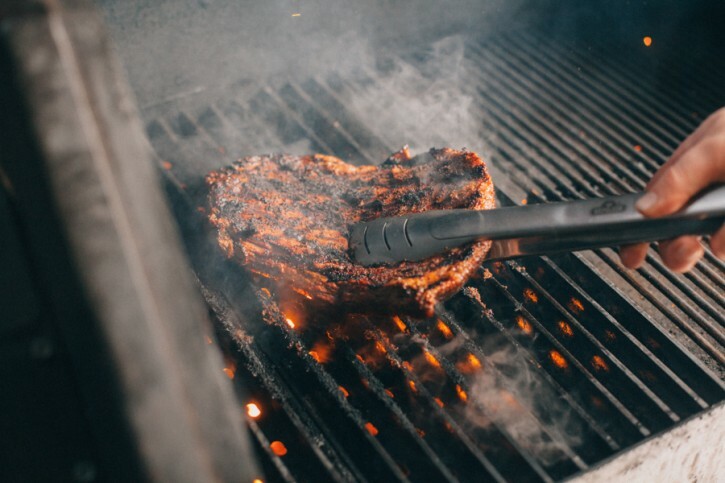 If the surface of the steak is getting too dark, move to a more indirect grilling area. Monitor the internal temperature with an instant read thermometer like the Maverick PT-100. Remove from the grill when the internal temperature reaches 125ºF. Rest 5-10 minutes before slicing. Slice the steak thin, against the grain of the meat. Mix the Mexican crema and Fiesta Juan’s Green Taco Sauce. 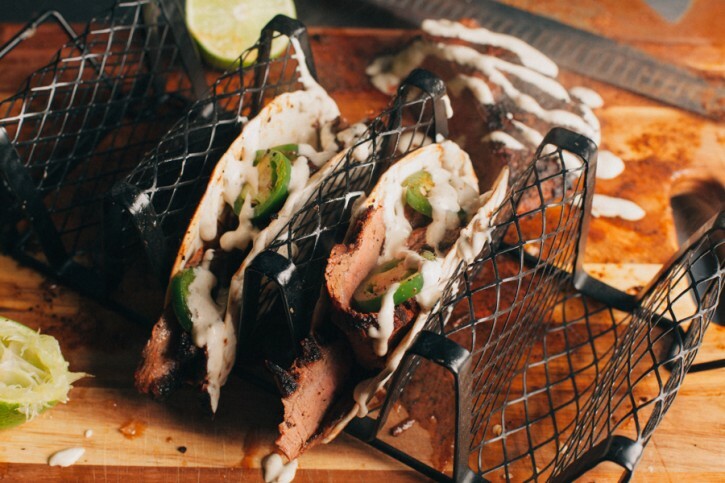 Serve the thin sliced flank steak topped with the crema sauce and sliced jalapeños.